A heartwarming tale for Christmas. Oh! I have found myself a new Romance author to read more from! 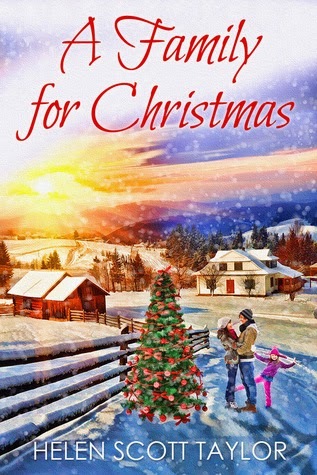 Helen Scott Taylor’s, “A Family for Christmas” has been my favorite Christmas story so far this season out of all the Christmas books I’ve read, and I want to read more books written by this author! This is a clean romance of 75 pages long. Out of the three main characters in this book, two adults and a little girl, the only one out of the three who knew what two people needed most was someone to in their lives to love, and that was a little girl named Polly! Eve was driving to a meeting that was hours away from her home when a blizzard started. It was dark out by now, and very difficult to see, when an animal of some sort was in the road in front of her. She slowed to miss it, but the ice and snow had her land in the ditch instead. As Eve was sitting in the ditch, she learned she had no cell service, either. Great. She was really stuck now. She looked around for other vehicles. None. What felt like forever did end when finally along came a tractor. The driver was a man named Tom. He explained to her there was absolutely NO getting her out of that ditch that night with the way the snowstorm was coming down. They could barely see a thing. He told her he realized this sounded strange to her, but she could either try to stay warm in her car overnight, or she could go home and stay with him. She was really stuck between a rock and a hard place. Either sit here and worry about dying of hypothermia, or maybe be safe with Tom. He had a friendly face, so she leerily trusted her gut and went with him. Once they reached his very nice home, (phew!) she was met by his six-year-old daughter, Polly. She was adorable! As the night went on, Polly became really close to Eve, even clingy. Later that evening Eve finds out about Tom’s ex-wife. Polly dropped more than a few hints very loudly to her father that she wants a new Mommy! LOL! That sure put Tom and Eve feeling odd! This was odd enough to begin with! As they talked well into the evening, both of them realized they really would like to share their lives with another person, never quite realizing it before. Both were attracted to each other, and Tom could see Polly was more than accepting of another woman in the house, heck, she was begging for Eve to stay and not leave the next day! Eve also thought to herself that she should be thinking more of settling down because if it was like this, she wanted this! Both Eve and Tom still feel awkward into the evening. They realize this is such an odd predicament they were in, especially with Polly interjecting things such as, ‘I want a Mommy’! This was the good part of this story and how this author wrote this book. You got an explanation of what, why, and where each character was at in their life in regards to dating, marriage, or neither, or maybe just a thought, then into the future the best each could do at the time, especially how things can change in a second, such as Eve’s car accident, and Tom’s divorce. Slowly they were learning more about each other, let alone how attracted they were to each other, but that they did not let the other in on. For what we would think was odd, the author had a believable explanation for it. The characters even discussed the oddness of the situation. We must give her some bravo for weaving that excellence into this story! Wonderful character development, discussions, daughter wanting a Mommy, etc., so even if you might think it is too quick for a possible relationship to begin, or not, there is a reason for everything, and a time for everything, too, right?! The next day Eve finds out she's stuck at the house with Tom and Polly, again! Oooo. This is going to be hard to leave with Polly really clinging to her even more. In fact, Polly started planning what they were going to do through the day! Yikes! You'll have to pick this short story up and read it one sitting. It’s one that will warm your heart! It's blessed with a little Christmas magic! I would LOVE to tell you more about this story, but then it would ruin the rest for you! I would like to take the time tonight to wish ALL of you HAPPY HOLIDAYS! Happy EVERY Holiday this season, there are so many! I celebrate MERRY CHRISTMAS!!!! So for those of you who will be celebrating this tonight and tomorrow, I wish you a wonderful one! Whatever you do with family and friends, please enjoy it! This IS the season to do that! With that, I close for tonight!